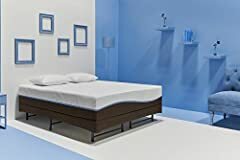 It’s a hybrid mattress, meaning that it features a layer of 100% natural Talalay latex that rests on fabric encased coils, encased in a wool outer cover. The wool encasement acts as a natural non-toxic fire barrier. I’ve seen similar mattresses go for at least double the price of this one. 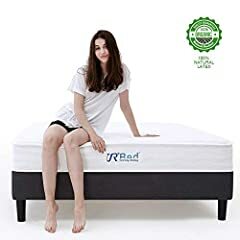 This non-toxic mattress is on the firmer side with a rating of 7/10 with 10 being the firmest. However, thanks to the supportive coil layer, it quickly responds to changing sleeping positions. You definitely won’t get that sinking feeling like with memory foam. The materials used in this mattress are high quality, yet the price is super affordable. Sunrising Bedding claims to make only 10% profit on this natural latex mattress. The Sunrising Bedding 8-inch hybrid mattress comes with a 120-night trial and a 20-year warranty. If you’re not sure about how you’ll sleep on this mattress, give it a try for a few weeks and see if improves your sleep experience. If you’re unsatisfied with it, you can return it no questions asked. Sunrising Bedding guarantees 100% satisfaction with your new eco-friendly mattress. In essence, there are two types processes used in the manufacturing of natural latex foam, Talalay, and Dunlop. The natural latex layer of the Sunrise Bedding mattress is made of 100% Talalay natural latex. 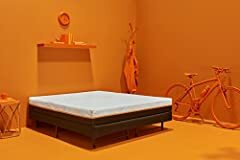 Talalay has a more consistent density when compared to Dunlop latex foam as the air bubbles within the foam are smaller and more evenly distributed. The Sunrising Bedding mattress is a hybrid latex mattress. This means that it is made of both a natural latex layer and a coil layer. These layers in combination make for a comfortable and supportive result. The bounce and firmness of a spring mattress are complemented by the contouring quality of 100% natural latex foam. One of the qualities of natural latex foam made from the sap of the Hevea Brasiliensis tress is that it has a high degree of elasticity. It adapts to your body when you change sleeping positions without transferring motion. This way, you’ll avoid waking up your partner if you toss and turn during the night. The natural latex in this mattress is made up of millions of tiny air pockets, which help distribute heat away from the body. Additionally, it has many ventilation channels baked into it which help draw excess heat away from the body. The benefits of natural latex are many. It won’t add any volatile organic compounds to the environment inside your home. Natural latex mattresses don’t off-gas chemicals like polyurethane foam, memory foam or gel foam. Moreso, the natural Talalay latex is hypoallergenic, dust mite resistant, mold resistant and mildew resistant. Natural Talalay latex is more durable than polyurethane foam, lasting up to 6 years longer. And, the high-carbon steel coils will not show any signs of sagging for at least 10 years, guaranteed. Since the coils in the spring layer of the Sunrising Bedding mattress are individually wrapped in non-woven fabric bags, they don’t make any noise when compressed. Additionally, since they are all independent of one another, they greatly attenuate and isolate any motion that is produced from changing sleeping positions. Your partner will love it! The Sunrising bedding mattress can be put directly on the floor if you don’t have a bed frame or a box spring. Avoid putting the mattress directly on the floor of a basement or concrete slab. Humidity may accumulate under the mattress and ruin it. The second option is to put it directly on a slatted frame as long as the gaps between the slats are no more than 3 inches apart. The third option is to put it on a box spring with a piece of 3/4″ moisture resistant plywood on top. The downsides of this mattress are few considering the price. -Thinner than other models I’ve reviewed. Although this might not influence the comfort of the mattress in any way. These points may not be a concern for you if you’re looking for an affordable way to replace your existing polyurethane foam mattress with a non-toxic mattress. 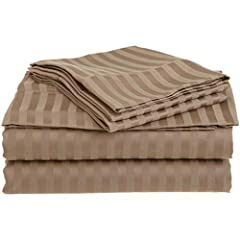 Selection Bedding Stripe Sheet Set-Short Queen Size Sheet Set-Organic Cotton Sheet set-500 Thread Count- 24 Inch deep Pocket-Taupe Sheet Set !! When I was a kid we called latex ‘ foam rubber mattresses.’ Now everyone is discovering them all over again. I don’t trust ANYTHING from NJ. Research before you buy. Most only last a few years and when you read the warranties they are a joke. Old latex mattresses lasted forever for a reason.